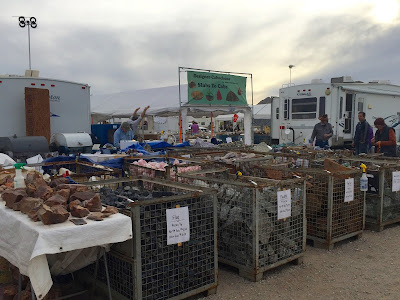 Day trip to Yuma from Quartzsite. While visiting our friends in Yuma, they gave us the grand tour of this city. Much agriculture here, the fields were brilliant green with several different kinds of lettuce growing. Other produce growing included spinach, broccoli, cauliflower and onions. We stopped at a farmers market and bought some fresh fruit and vegetables. They drove us a little further south to the border town of San Luis. We were surprised to see this border wall, it's 20 feet high, a steel curtain of sorts. They say it's effective here, although a wall of this type only exists in certain areas on the border. Another day trip was a drive north to Parker AZ, we followed the Colorado River which separates California and Arizona. We found these wild burros in a little wayside on the river. They didn't seem too wild, although this was as close as we got. I think they're looking for a hand out or picnic left overs. They were fun to watch. We were surprised at how clean the water is and such a beautiful blue color. We drove to Parker to see what the "Parker 425, Blast in the Desert" was all about. It's an off-road race that covers 425 miles in the desert, it was exciting and amazing to see. 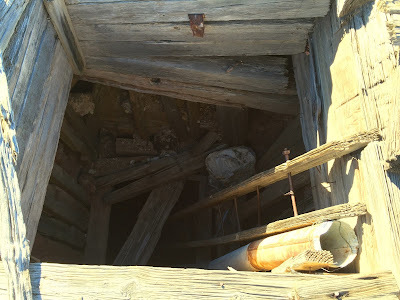 Remnants of another abandoned mine near Quartzsite. Native American grinding holes near Quartzsite. We joined in a group tour with the Escapees Geocachers. (More on Geocaching later. ) My friend and I are demonstrating how the Native American women ground corn into flour. This is the site of an ancient settlement, the surrounding cliffs have interesting petroglyphs. We've been learning about geocaching and are thoroughly enjoying this new activity. Geocaches have taken us to places we wouldn't have discovered on our own, often times interesting history is associated with the placement of the geocache. Here is one of our first geocache finds, (see tin box under stump), somebody put a fake snake there which got quite a reaction out of me. ha ha. We found another geocache a few miles out of Quartzite, this desert area is known as Company B. It was a training ground for the military during WWII, General Patton was stationed here for a time. Rocks served as boundaries for roads or tent placements. We also found a big letter "B" drawn out with rocks. Another day trip was to the abandoned mining town of Swansea. The town once had a population near 300 residents. The mines first closed in 1912. New owners restarted the mining operations and continued on for several years. The post office closed in 1924 as population decreased, by 1937 the mines were shut down for good and Swansea became a ghost town. Huge metal cover over one of the deep mine shafts at Swansea. The shaft goes straight down, we couldn't see the bottom. Swansea is listed as a Historic Town Site, interesting signage tells of the history and the layout of the town. Some of the old housing units are being restored, others have crumbled to the ground and all that remains is an outline of adobe rubble. Beautiful colors in rocks at Swansea. I don't know what the minerals are in these rocks but the colors were outstanding. 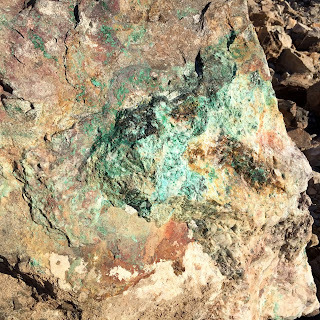 Wondering if the turquoise color is from copper since Swansea processed copper ore from area mines. Memorial to Hi Jolly. There are many references to camels in Quartzite. In 1857, a man named Hadji Ali, (later nick-named Hi Jolly) a camel driver brought a company of camels from the Middle East to be used as pack animals for the U.S. military. They were under the command of the U.S Camel Corps. The camels could go without water longer than horses and the desert environment suited them. The experiment was terminated early due to the Civil War. Hi Jolly bought a couple camels and operated a freight route between the Colorado River and mining towns. Other camels were sold or ended up in the wild fending for themselves. The camels eventually died out, however as late as the 1930's there were reports of camels spotted in the wild. Legends still exist about the camels including one about a ghost of a camel that roamed the desert. Hi Jolly remained in Quartzsite and was buried there in 1902. Quartz crystal, a sought after find by rock collectors. There is a ton of quartz in this area, but difficult to find the clear formed pieces as in the photo (taken at a rock shop). The quartz we found is a more of a solid white rock, but still pretty and worth carrying a couple rocks home in my backpack. 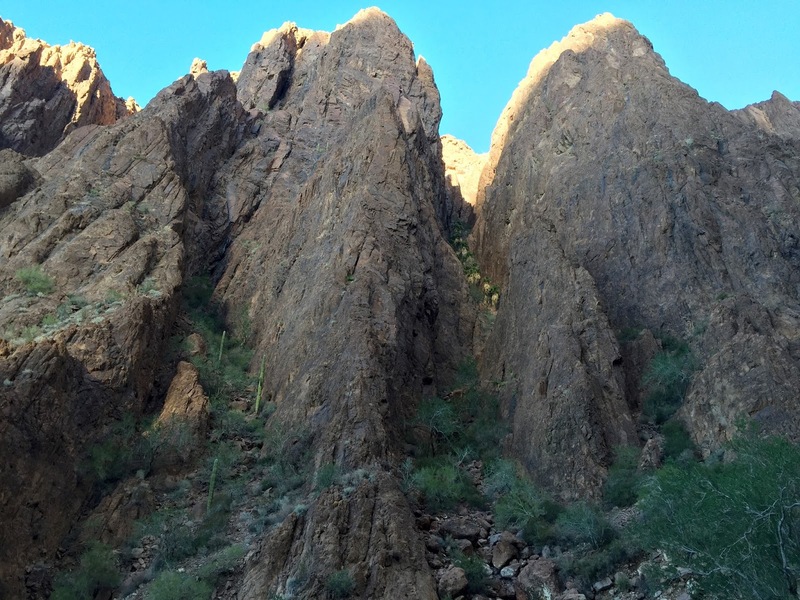 Crystal Hill is located south of Quartzsite in the Kofa National Refuge. Crystal and mineral collecting is permitted in the Crystal Hill area but restrictions have been put in place due to the severe digging that's taken place over the years. These deep caves have been dug by collectors in the past. Today it's very picked over, only surface collecting is permitted, no picks or hammers. We did find some very small pieces of crystal which added to the fun of hiking in this area and enjoying the views from the top of Crystal Hill. An unusual site on a desert trail...clumped together high up between the canyon walls, a stand of 30+ native palm trees are growing. (Might be hard to see in the photo, they look like little yellow dots half way up the mountain). Being in the canyon, the palms get some moisture and are protected from the hot desert sun. I love these colors... another flea market stand. There are several different flea markets in Quartszite. 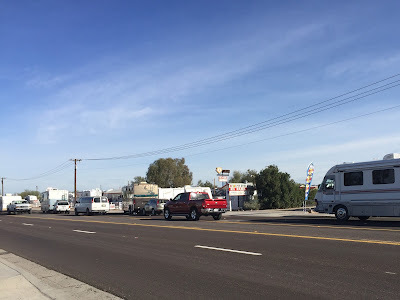 On the right is the RV Pit Stop, The Scenic Road RV Park (where we stayed) is across the highway. The Pit Stop is a very popular spot in Quartzite, RV's often lined up on the highway waiting to turn in. The Pit Stop had water for drinking and for water tanks, propane and a dump station. 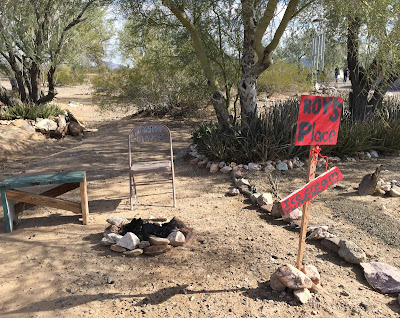 There are so many RV'ers that dry camp out on the BLM land...they have to come into town regularly to take on water or to dump. Filling water jugs at the Pit Stop. 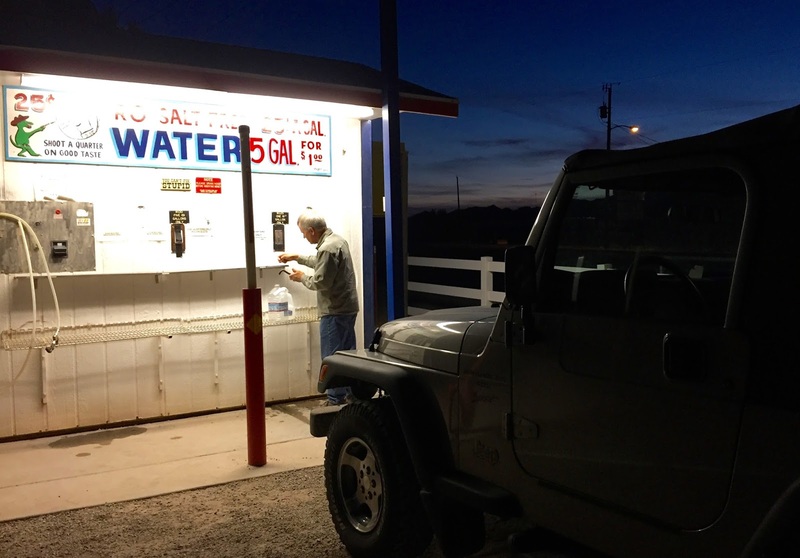 Our grandparents would be in disbelief to see us all buying water these days. Water (especially if it's free) is one of our many blessings to be thankful for but often taken for granted. To our family and friends in WI, you have the best drinking water ever! We met a prospector here who we talked to for some time about the area's mining history. We were amazed at all the mining that had taken place, all the open mines that still remain and all the claims that are still visibly staked out. 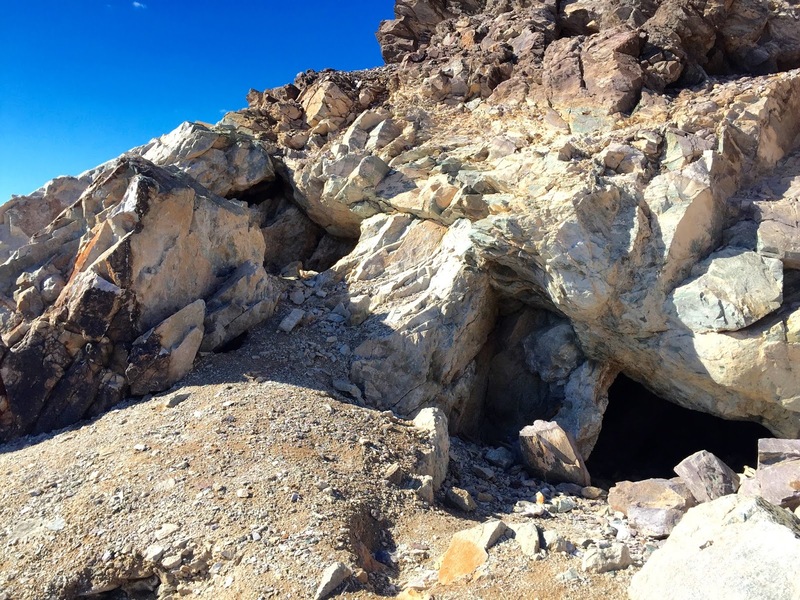 There are so many open abandoned mines in this area, the ground underneath must be like swiss cheese. We could not see the bottom of this shaft, yikes. One needs to exercise caution in exploring these areas. he lived here into the 1960's when he died at the age of 75. We saw some of his woodworking pieces at the little museum in town, very beautiful. Celia's Rainbow Garden, it's a peaceful place. This beautiful memorial park in Quartszite covers several acres, it is dedicated to a local girl named Celia who died at the age of 8. People create memorials in remembrance of their loved ones, the above dedicated to a local musician. Another memorial in the Rainbow Garden. Thinking Roy must have liked sitting around a campfire. Many of the memorials were so creative and a reflection of their loved one. There were some with bird houses and statues, hiking boots, military signage and family handprints. Good Night from our RV Park in Quartzsite.